This light, and slightly boozy dessert is the perfect way to finish a heavy meal. The apple caramel adds a sweetness to an otherwise sharp, refreshing dish. Bring 120ml/4fl oz water and the caster sugar to the boil. Once the sugar has dissolved, remove from the heat. Add the gin, tonic, lemon juice and the grated Bramley apple. Set aside to cool completely, then pour the mixture into a plastic freezer-proof container and place in the freezer. Every 30 minutes, remove from the freezer and whisk. Repeat this until frozen (this will take about 3-4 hours). To make an apple caramel, heat the apple juice until reduced in volume to a thick caramel (this will take approximately 45 minutes). Remove from the heat and whisk in the butter. Leave to cool. 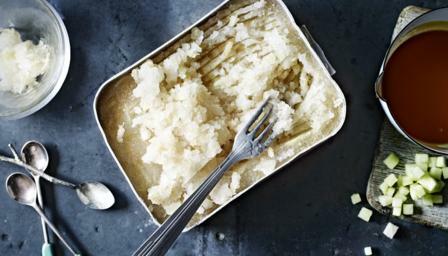 To serve, remove the granita from the freezer and break up with a fork to create a ‘slush puppy’ texture. Sprinkle the diced Braeburn apple on top and serve with the apple caramel.